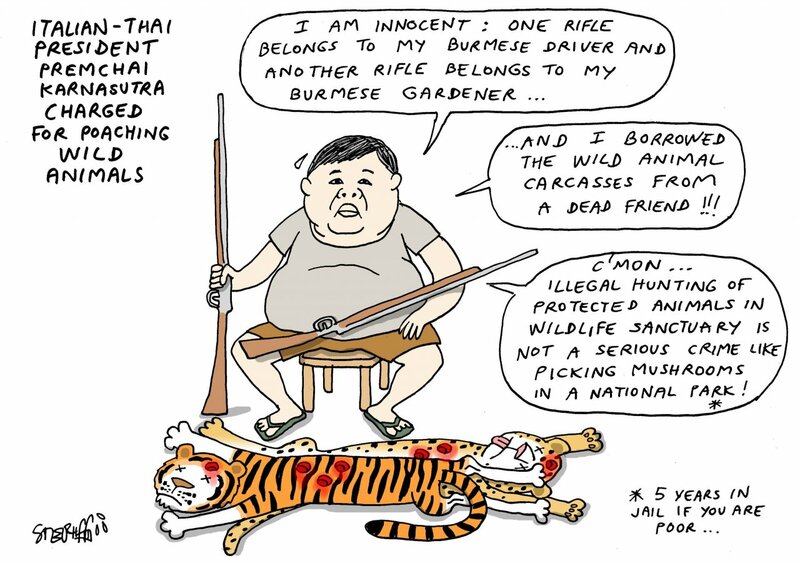 A park ranger stands guard over Italian-Thai Development Plc president Premchai Karnasuta, sitting, and the other suspects at their hunting camp in Thungyai Naresuan Wildlife Sanctuary in Kanchanaburi province. 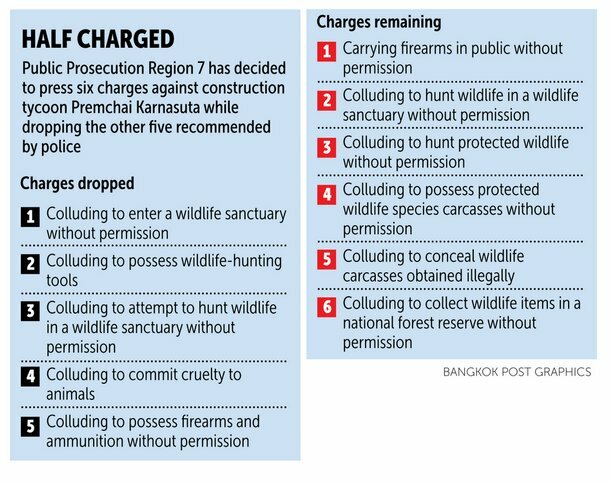 Construction tycoon Premchai Karnasuta has been arrested for allegedly hunting wildlife in the World Heritage Thungyai Naresuan sanctuary in Kanchanaburi province. 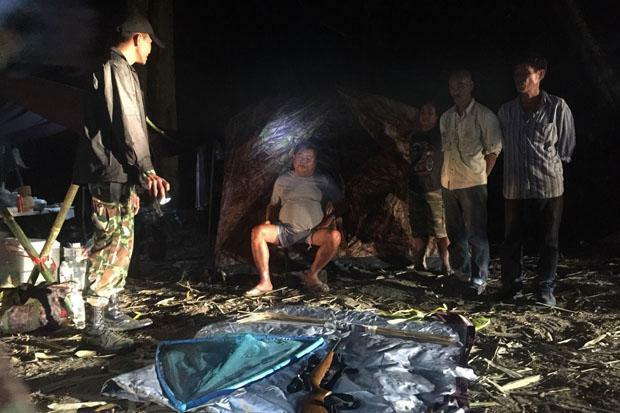 Park rangers arrested Mr Premchai, the 63-year-old president of the huge SET-listed construction company Italian-Thai Development (ITD), in a no-camping area of Huai Pachee forest in the western part of the Thungyai Naresuan Wildlife Sanctuary in tambon Chalae of Thong Pha Phum district late on Sunday night. Officials found skinned carcasses of protected wild animals, including a 1.48-metre-long black panther, a Kalij Pheasant and a barking deer, three long-barrelled guns and ammunition in his possession. Bliver interessant at foelge den sag. Som det er normalt saa er rige personer altid uskyldige. Lige nu har politiet fundet paa at det er den forest ranger som arresterede de 4 personer har gjort noget forkert fordi de 4 personer er blevet lukket ind i nationalparken uden at have betalt entre. Princess Ubolratana has urged Thais to provide moral support to national park officials following the arrest of Italian-Thai Development Plc president in the high-profile poaching case. The Princess posted on her Instagram that Thais should provide moral support to park officials to shield them from persecution. The Princess was responding to a post on her wall by an Instagram user “yaiwoy” asking what ordinary people could do in the case of the arrest of ITD president Premchai Karnasuta for allegedly killing a rare black leopard and some wild animals in the Thung Yai Naresuan wildlife sanctuary in Kanchanaburi. “Give moral support to all operating officials so that they will not be harassed. We all must instil the value that no one should have privileges than the others. Don’t forget that this country belongs to all Thais, not specific persons,” the Princess replied. KANCHANABURI: First it was one, then five and now eight. That was the number of bullet holes found in the skin of a black leopard, one of at least three protected wild animals found dead at the camping ground inside the western part of the Thungyai Naresuan Wildlife Sanctuary where Italian-Thai Development (ITD) president Premchai Karnasuta and three other persons were arrested by park rangers on Feb 4. The Royal Forestry Department will press charges against a company belonging to relatives of Premchai Karnasuta, the embattled president of Italian-Thai Development Plc (ITD), for encroaching on over 6,000 rai of public forest land in Loei's Phu Ruea district. The department reportedly decided to pursue the case after an audio recording emerged of a conversation believed to be between Mr Premchai and his group while in custody. In the clip, someone says Mr Premchai owns a house on a mountain in Loei's Phu Rua district. An examination of the plot of land, owned by PCK International Company, of which Mr Premchai is a board member, will be carried out, according to Attapol Charoenchansa, the deputy chief of the department. The disputed plot is a 6,215-rai area near Rang Yen Resort for which land title deeds were found to have been illegally issued. In 2003, the Department of Lands withdrew all title deeds for the plot as it was found to be encroaching on a national park. 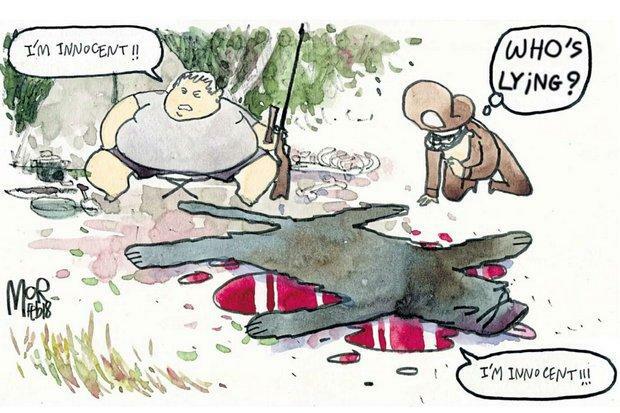 Forensic police examine bullet holes in the body of a black panther found at the camping ground in the Thungyai Naresuan Wildlife Sanctuary where Italian-Thai Development president Premchai Karnasuta and three other persons were arrested. Det bliver spændende at se hvilket resultat det hæderskronede thailandske politi når frem til. 1) Det var reservatvagterne der skød panteren, og var så nedrige at de brugte tyksakkens våben. 2) At det her er det værste selvmord de nogensinde har set. Social media has been flooded with angry questions after the Office of Public Prosecution Region 7 announced its decision Wednesday to drop almost half of the charges against Mr Premchai. Intet nyt fra Østfronten, alt er ved det gamle i Land of Scam, de fattige straffes og de rige går fri.
Folkevalgte politikere tvinges til landsflugt for korruption, mens dem der anklager dem overtager forretningen, og fortsætter hvor de gamle slap. Billionaire construction tycoon Premchai Karnasuta was this morning (Tuesday) sentenced to 16 months in prison without suspension by the Thong Phaphume provincial court in Thailand’s western province of Kanchanburi.